Radiotherapy-induced dysfunction of the gastrointestinal tract is common in cancer patients and has a significant impact on their quality of life. In this study, we investigated the prevalence of breakthrough cancer pain (BTcP) in patients undergoing 3D pelvic radiotherapy and who had proctalgia. This observational, multicenter, cross-sectional epidemiological study was performed in 13 Spanish hospitals. Data were obtained on the presence and characteristics of BTcP, demographics, common comorbidities, and treatments prescribed to the patients. The prevalence of BTcP in patients undergoing pelvic 3D external radiotherapy with proctalgia (N = 105) was 48.6% (95% CI 39.0–58.1%). BTcP was further characterized in 59 patients. The mean (± SD) intensity of the BTcP episodes was 7.45 ± 1.47 in a visual analog scale. 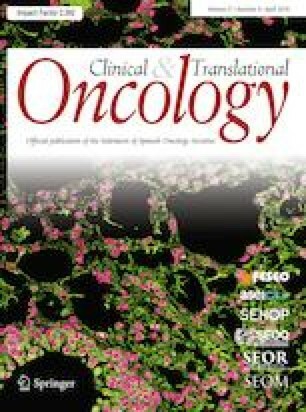 We found several statistically significant associations between the descriptive variables of BTcP with demographic and clinical variables associated with the tumor or the patient, such as an increased number of BTcP episodes per day depending on the presence or absence of diabetes (p = 0.001, Chi-square) or time to the onset of pain relief depending on the location of the tumor (p = 0.019, Chi-square). Fentanyl was the drug of choice in BTcP episodes for 95% of the patients. This study demonstrated a high prevalence of BTcP prevalence in cancer patients undergoing pelvic 3D radiotherapy and with proctalgia. Although the variables determining the onset of BTcP are still unclear, our results could help in the design of future clinical studies addressing the treatment of BTcP in these patients. The PrevaDIOR Study Group is formed by Vicente Tormo and Marta Marcos (Hospital Universitario San Juan de Alicante, Alicante, Spain); José Pardo and Neus Aymar (Hospital Universitari Son Espases, Palma de Mallorca, Spain); Eduardo Hortelano and Amanda Flaquer (Hospital Universitario de Araba, Vitoria, Spain); Esther Jordá (Hospital Clínico Universitario de Valencia, Valencia, Spain); Sofía Córdoba and Juan Antonio Corona (Hospital Clínico San Carlos, Madrid, Spain); Carlos Ferrer, Alicia Francés, Virginia Morillo and Ana Bouche (Consorcio hospitalario Provincial de Castellón, Castellón, Spain); Susana Marín, María Cambray, Montse Ventura and Hector Pérez (Institut Catalá D’Oncologia L’Hospitalet, Hospitalet, Spain); Ruth Hernandez, José Javier Martín, Leonardo Lorenzo and Claudio Fuentes (Hospital Universitario Nuestra Señora de la Candelaria); Mercedes Zurita and Rosario del Moral (Complejo Hospitalario Regional Virgen de las Nieves, Granada, Spain); Víctor Muñoz, Alba González, Manuel Enguix and Marta Martinez (Hospital do Meixoeiro, Vigo, Spain); María José Ortíz and María Carmen Fernandez (Hospital Virgen del Rocío, Sevilla, Spain); Enrique Cárdenas and Antonio José Lozano (Hospital Clínico Universitario Virgen de la Arrixaca, Murcia, Spain). The authors thank Francisco López de Saro (PhD) for medical writing support. Kyowa Kirin Farmacéutica SLU supported the study. Apices Soluciones SL was contracted by Kyowa Kirin Farmacéutica SLU for the design, monitoring, and statistical analysis. Trialance SCCL was contracted for the production and management of publications. This study was approved by the Clinical Research Ethics Committee of the Hospital San Juan of Alicante, Spain, on March 6th, 2017. All patients participating in this study signed an informed consent.